Being a caregiver for a loved one is a rewarding task. In order to be the best caregiver possible, though, it is important to take care of yourself. When you take time to do this, you will feel better about yourself, stay healthier, and continue to enjoy the act of taking care of the special person in your life. Continue reading to learn about the importance of self-care for the family caregiver and some helpful tips. Exercise-Taking the time to exercise will not only help you feel better physically, but it can improve your mental state, too. Exercise can help you get a better night’s sleep, too. Experts recommend a total of two and a half hours or more of activity each week. Not sure how to fit it in? Take a 10 to 15 minute walk a couple of times a day. Even this can improve things. Healthy Eating-Eating healthy is important while caring for others. While grabbing fast foods may be easier, choosing healthy options throughout the day helps to keep your energy level up. Sleep-Nothing can take the place of a full night’s sleep. Try your best to sleep seven to nine hours each night. If this isn’t an option, try your best to take a nap during the day. Me Time-Each day or several days a week, find at least a few minutes to do something you enjoy. Whether it is painting, spending time with friends, reading, crafting, or whatever it is you enjoy. Support-Being a caretaker places you in challenging situations. Taking a class or finding a support group allows you to talk with others in the same situation and gives you the opportunity to learn new ways to deal with various issues. Visit the Family Caregiver Alliance website to find groups in your area. Check-ups-Make sure you keep up with your medical and dental check-ups. Even if you are healthy and feel that nothing is wrong, it is important to keep up with these important visits to stay on top of your health. Keeping yourself healthy allows you to continue caring for your loved one. As you can see, it is important to continue taking care of yourself while being a family caregiver. When you keep yourself healthy and happy, you are able to give the best care possible to your loved one. Originally written by Ruby Cemental for Caring Senior Service. Cedar Hill and the Village at Cedar Hill, is a family-owned and operated senior community, providing a supportive and comfortable home to seniors in all stages of life. 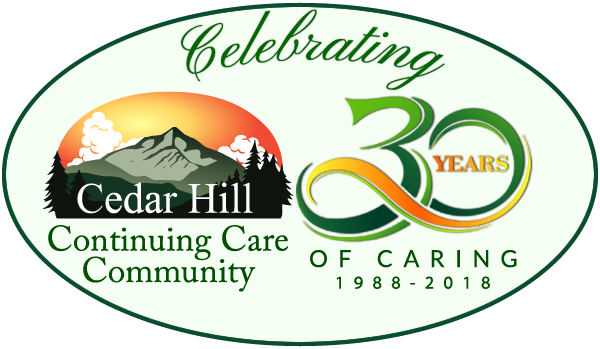 Cedar Hill Continuing Care was founded in 1988 by Mary Louise Sayles, a registered nurse and licensed nursing home administrator with many years of experience in long term care administration. Mary Louise’s daughter Patricia Horn, who is also a licensed nursing home administrator, is currently the Community Administrator.